Jimdo is one of the most highly recommended site builders in the world. With its easy to use interface, Jimdo has helped in creating over 200,000 online shops since its launch in 2010. Setup is fast and easy and it will take only a few minutes before you can start selling and taking orders from buyers from all over the globe. A very dynamic package, Jimdo website builder has proven to be an excellent option for businesses, whether you are a freelancer or a budding entrepreneur. Jimdo offers a simple way to create a website using a tablet, smartphone, or computer. It provides an intuitive interface that allows even novices to build a customized online presence with an e-commerce store and blog. This application is offered in 12 languages and more than 8 million sites have been developed using it. The Jimdo online store takes only minutes to set up and you can start accepting orders from global buyers immediately. Jimdo’s team keeps adding new features and tools, and at the same time they ensure they don’t over-complicate the platform. This means the newer features do not signify more complexity which is great news for users. You can get started by selecting from a range of mobile-responsive templates to design your site easily and quickly. Why should you opt for Jimdo over other site builders? To start, it is fast and user-friendly. The platform’s intuitive interface does not require you to be an expert in coding. You can add text and images in a breeze. Flexible and free, you can edit your website using your mobile device and update it via Jimdo’s free iOS and Android app. Build your store, add products, and sell in a matter of minutes. This is e-commerce simplified right down to the core. Jimdo is an international site builder as it has teams located all over the world. So if English is not your native language, Jimdo is the best tool for you. If you know coding, you can access HTML/CSS codes and edit them to your template. Plus, you get the option of doing the editing later if you are not inclined to do it immediately. The JimdoFree plan provides all the tools you need to create a functional website. There is no time limit to this plan and you are under no pressure to switch to a paid plan. Plus, you don’t need to provide any credit card info to sign up for this free package. Jimdo sites are automatically optimized for search engines. Plus, subscribers of the paid plans can do further SEO work by applying meta tags to each web page. The vendor offers useful SEO tutorials on their site to help you enhance your knowledge and skills. The tutorials can enable you to improve your SEO planning and techniques. Jimdo offers live chat support from 9am – 5pm PST. You can also try email support and their agents typically respond within 1 to 2 business days. So if you run into any issues you can count on reliable assistance to get them resolved quickly and satisfactorily. If you are interested in Jimdo it could also be sensible to check out other subcategories of Best Shopping Cart Software listed in our base of B2B software reviews. Since each enterprise has specific business needs, it is advisable for them to refrain from seeking a one-size-fits-all faultless software system. Needless to say, it would be futile to try to find such a system even among market-leading software solutions. The intelligent thing to do would be to catalog the various essential aspects that need consideration such as required features, budget, skill levels of employees, company size etc. Then, you should do your groundwork thoroughly. Read some Jimdo reviews and investigate each of the other apps in your shortlist in detail. Such comprehensive groundwork can make certain you discard ill-fitting applications and zero in on the solution that provides all the elements you need for business success. 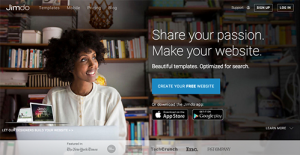 A free plan plus three priced versions are what website builder product Jimdo offers. Each plan is developed to meet the needs and requirements of every business without breaking their budget. All plans are billed annually. We realize that when you make a decision to buy Website Builder Software it’s important not only to see how experts evaluate it in their reviews, but also to find out if the real people and companies that buy it are actually satisfied with the product. That’s why we’ve created our behavior-based Customer Satisfaction Algorithm™ that gathers customer reviews, comments and Jimdo reviews across a wide range of social media sites. The data is then presented in an easy to digest form showing how many people had positive and negative experience with Jimdo. With that information at hand you should be equipped to make an informed buying decision that you won’t regret. What are Jimdo pricing details? What integrations are available for Jimdo? If you need more information about Jimdo or you simply have a question let us know what you need and we’ll forward your request directly to the vendor.